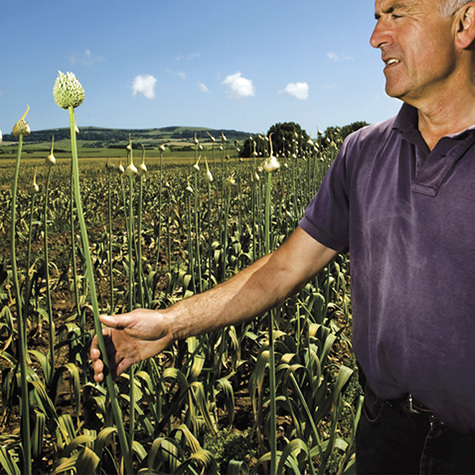 Elephant Garlic, like all hardneck garlic types, produces a flowering spike or flowerhead known as a “scape". These eventually, by July, become 6ft high purple flowering balls like other flowering alliums in the garden. However, most growers snap the scape off as it appears, to encourage enlargement of the bulb. 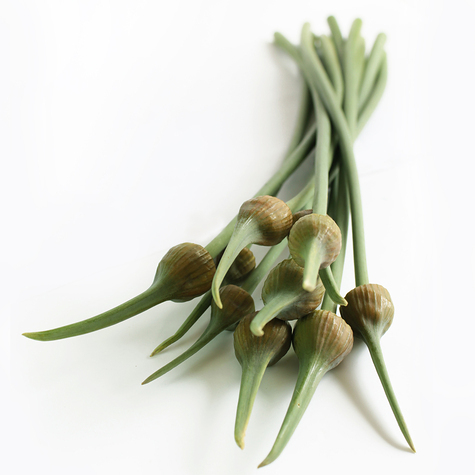 The scapes have a mild garlic/allium flavour and are hugely popular at The Garlic Farm, blanched initially, held in a refrigerator and later cooked battered in tempura accompanied by a sweet chilli sauce dip. Scapes cut into green bean sized portions, sauted in butter & salt are also a perfect way to enjoy this seasonal product. You can also cook them on the barbecue and then drizzle with olive oil for an asparagus style appetizer.